ABP Biosciences has developed two methods for fast and sensitive detection of Mycoplasma infection: MycoCheck™ Mycoplasma PCR Detection Kit and MycoCheck™ Mycoplasma Stain Kit. The MycoCheck™ Mycoplasma PCR Detection Kit allows for fast and reliable identification of mycoplasma contamination in cell cultures. Mycoplasma DNA in the cell culture supernatant is amplified via PCR and visualized using gel electrophoresis. In addition to the short detection process (less than 2 hours), the easy handling and high sensitivity makes this Mycoplasma PCR Detection Kit a convenient tool for routine examination of cell cultures and media. The kit contains an optimized PCR master mix and a positive control. 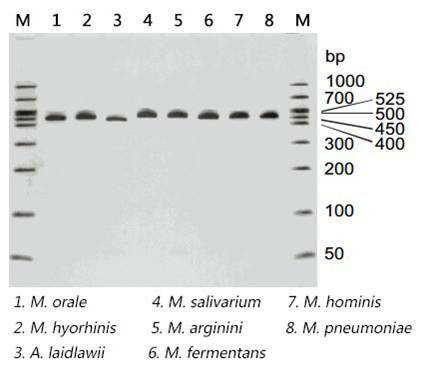 The primers in the PCR master mix are highly specific to the conserved rRNA region in the mycoplasma genomes and can detect all well-known mycoplasma genera, including the commonly encountered ones in cell cultures, such as M. orale, M. hyorhinis, M. laidlawii, M. salivarium, M. arginini, M. fermentans, M. hominis, and M. pneumoniae. Mycoplasma positive samples can be easily recognized by a distinctive PCR product ranging in size from 400 to 600 bp.